The black BDR-XD055 6x Slim Portable USB 3.0 BD/DVD/CD Burner from Pioneer is a slim, lightweight, and portable Windows and Mac compatible optical drive. This drive supports Mac OS X 10.6 to 10.12 (Mac software package not included) and Windows XP SP3, Vista, 7, 8, 8.1, or 10. It features playback, read, and write support for a variety of optical media, including BD-R, BD-RE, BD-XL TL, BD-XL QL, BD-ROM, DVD±R, DVD±RW, DVD-RAM, CD-R, CD-ROM, and CD-RW. This broad range of formats allows you to select the media best suited for your needs. This drive connects to your Windows or Mac compatible system using a USB 3.0 connection. The USB 3.0 connection also powers the drive which features a 4MB buffer. While this drive is designed for USB 3.0, it is also backwards compatible with USB 2.0. A secondary USB port is built into this drive and it is recommended that this additional USB port be used alongside the primary USB port to help ensure stability if the drive is being connected via USB 2.0. This drive is well suited for Mac users who already have disc burning software and has other built-in features such as PowerRead, Auto Quiet mode and PureRead2+. In the Mac OS environment, the Finder may be used to read and write to BDXL, Blu-ray, DVD, and CD media, while the DVD player may be used to play DVD movies. 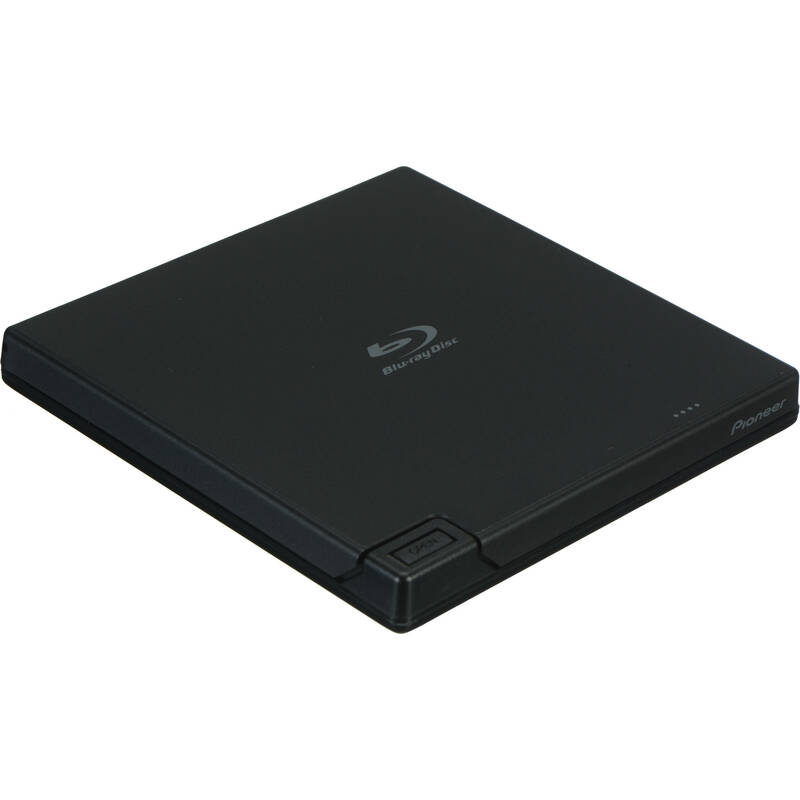 Box Dimensions (LxWxH) 8.661 x 6.535 x 2.441"
BDR-XD05B 6x Slim Portable USB 3.0 BD/DVD/CD Burner (Black) is rated 4.4 out of 5 by 129. Rated 4 out of 5 by Jonathan from Well Designed I mainly use this unit to watch bluray movies on my laptop which only has a DVD drive built-in. For the most part this drive performs well with reading movies. The dual-usb cable provides more power to the drive which is essential for stable usage. While the USB3.0 feature is a plus, my laptop only has USB2.0 ports and this drive still works great. Burning BluRay media is easy and works great. It can still take a long time if you try to fill a single BR disc in one-shot but it still works. I've only had a minor issue with watching movies where they would skip or show pixel artifacts but I think the issue was more with the media than the drive. Rated 4 out of 5 by Mike V from Simple tool It's not a plug and play device for the Mac. You have to go to YouTube and watch this review where this guy explains what settings to change and what drivers to download in order to simply playback blu-ray discs on a Mac. As for burning, you also have to make sure that you check the compatibility of the blank media with this particular model. If you're planning to use this to back up critical client media or something important, you don't want to burn at 6x. It's potentially unstable. However, these are just things you'll want to to know. The device does it's job. Rated 5 out of 5 by MMVP from Love my new Pioneer BDR writer! Easy setup, heck there is no setup.? You just plug and play.? I've now written different types of media on this writer.? DVD-R 4.7 and? DVD+R DL, BD-R Blu-Ray, and BD-R DL.? I have not yet written to BD-R XL.? The writer is quiet while writing.? I also to many "on location" assignments, which makes this writer a must because it is so light and portable.? My computers all iMacs (21.5" and 27" and yes they go where I go) and I use both Adobe and FCPX software.? I'm a photographer and videographer with over 45 years experience.? I love what I do and I don't like complicated equipment.? The Pioneer BDR-XD05S is Perfect! Rated 4 out of 5 by Anonymous from Bye it and you won't be disappointed This is a Nice, small Blu Ray Combo player. It has excellent reviews against other devices of this type which I researched well before buying. This was the reason I purchased it and so far I have not been disappointed. Though it does have software included it is dated and I had some problems during Blu ray playback. The BDR-XD05B is the only one that includes software for playback. I purchased the latest Cyber link software and this seemed to take care of the problem. I Like the features and the size is great and fits my laptop bag well. The only reason it got 4 stars was the software, though it might work well for you. It fit my needs well. B&H had the best price and was delivered in a few days. Thanks guys. Rated 5 out of 5 by Borderjack from Works like a charm My latest laptop computers do not incorporate a built-in drive. The Pioneer BDR-XD055 fills that void and allows me to read and write CD's, DVD's and now BD's with ease.My main uses are for burning video DVD's and BD's and for reading/playing pre-recorded media. I have experienced any media that I could not read or write to and have tried CD-/+R, DVD-R and BD-R. I have played DVD and Blu-ray movies without problems. The Pioneer is small and lightweight in my computer bag. A USB3.0 Y-cable with an additional power USB connection is included. The second connector is for low power USB ports. I have found that my Lenovo Carbon X1 has enough power that only the main USB connection is required to power and operate the drive. I am considering a second unit for my wife. Rated 5 out of 5 by Edward from Perfect DVD Accessory For Thinkpad T470p Purchased to use with LENOVO Thinkpad T470p. This computer has only USB 3.0 ports. The supplied BDR-XD05B connector cable has a bifurcated end on the computer connector side, allowing supplemental powering of the device if used with a computer only having USB 2.0. Was easy enough to find online another connector cable which did not have the bifurcated end - makes for a better cosmetic appearance when used with the T470p. I didn't use the included software on the T470p. Used an older ROXIO program that supports Blue Ray - ROXIO Creator 2011. Burner seems to work fine with the T470p and takes up little space in the computer carrying bag. Rated 4 out of 5 by David from Mostly what I expected Works very well and does what it's supposed to do. It's a little noisy when watching a video because of the constant reads. And it doesn't come with any software (but I knew that from other reviews). I was able to find a freeware Blu-Ray player called Leawo that seems to work OK. I believe Pioneers front load external BD player is quieter, but it's $40 more. I kind of like the top load setup as well. Does it support Disc BD-R LTH Low to High? I'm not sure If I am asking this question in the proper place but.....I own the late 2013 Mac Pro. Does anyone know if you can hook up 2 or 3 of these BDR-XD05's to a mac pro and burn blu rays at the same time on 3 different burners? Thank you. Both the DVD-R DL and DVD+R DL speeds are 8x. i have the cyberlink softwre, if i purchase this burner, can i make a blu-ray disc out of my video clips? cause in the past, i did buy one and i had no idea on how to do it? btw, i have the cyberlink powerdirector 14 software; i normally film sports events. please help. This burner does not include any software to convert your video clips to blu-ray format and is intended for someone that already has the software needed. Can this device be connected to a desktop PC with relative ease? I connect it to a Microsoft Surface Pro and it works okay. Does it work with W7 and Linux mint? M-disc support? Thanks. I have not had any issues with this burner with using K3b on Linux Mint XFCE. In order for K3b to burn to bluray disks you do need to remove wodim and replace it with cdrecord. Have only used it a couple of times but haven't had any problems with a Dell XPS13 laptop running Windows 10.
this unit does not load all the music on my backup discs on my H P win 8.1 computer do I need todownload a driver? Is your player capable of playing the music files? If it will, you may have some bad files or bad sectors on the disc. The BDR-XD05S is capable of reading good data only. Answered by: John (Jack) D.